Supporters and opponents of scrapping Skowhegan's native mascot recently. The heated debate over use of Native American names, symbols and images moved from the Skowhegan School Board to the Maine State House Monday, where lawmakers are now considering a bill to ban the use of Native American mascots in public schools. 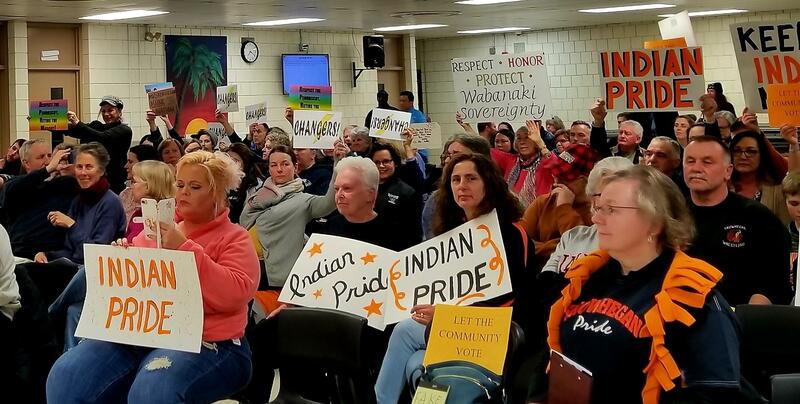 Skowhegan’s school board recently voted to end the use of the “Indians” name. But the bill’s sponsor and others say legislation is needed to ensure that such symbols are not adopted in the future. Skowhegan was the last school in Maine to use a native mascot, paving the way for Maine to become the first state in the nation where imagery and names deemed offensive to indigenous people are officially retired from schools. But just to make sure it doesn’t happen again, supporters of the bill want to make the ban permanent in state law. The bill’s chief sponsor, Democratic Rep. Benjamin Collings of Portland, says his own hometown of Fort Kent took the action when asked to do so by the tribes. “We need to also talk in this committee, with Education, what is best for the students in a school? And if there is a mascot that is deemed to be offensive, is that in the best interest of the students?” he says. The American Psychological Association, the National Congress of American Indians, the National Education Association and others say native mascots are harmful to students because they perpetuate misleading and often insulting racial stereotypes. Former Penobscot Nation Chief Barry Dana recalled how as a standout athlete at Old Town High School he felt privately conflicted about his school’s nickname: the Indians, which has since been dropped. “I was troubled. I was confused. I didn’t represent Old Town as an Indian. I represented my nation as an Indian. I represented Old Town as an athlete and I was proud of that,” he says. In the debate over ending the use of native mascots, some have argued that they are meant to honor indigenous people, but Dana says such thinking is flawed. “Am I honored as a native person to be used as a mascot? No. It would be the same as shoving down garlic down your throat and saying, ‘You like that taste.’ No, I don’t. That’s how offensive it is for any race to dictate to another race how they need to be honored,” he says. In Skowhegan, residents upset about the school board’s recent action have vowed to keep up their fight. They’ve been circulating petitions, pressing for a local referendum and increasing membership in their closed Facebook group, Skowhegan Indian Pride. School Board member Jennifer Poirier, the group’s administrator, told the Legislature’s Education Committee that she opposes the bill because it’s a violation of the First Amendment protecting free speech and the 14th Amendment guaranteeing equal protection under the law, because it dishonors a specific group. “It singles out Native Americans and includes no other race or ethnic identification. Approval of this bill would allow any other group of people to be honored and recognized but would discriminate against the Native American population,” she says. “We’ve been discriminated against just like they have. We’re becoming a minority. Other minority groups that have been considered minorities are getting special treatment right now, not only the Native Americans but the Mexicans,” she says. Originally published March 26, 2019 at 9:06 a.m. ET. After years of contentious debate, votes, policy reversals, and almost 100 years of tradition, Skowhegan High School will no longer be allowed to use the name "Indians" as its mascot.